I just can't resist... It's probably not cool to post these before we've actually signed a construction contract (we only have a design agreement), but I'm just bulging with excitement that we're approaching a plan! And, quite a few of the elements in the arrangement were my idea; it was a bit of a group effort. We should have full elevations next week! 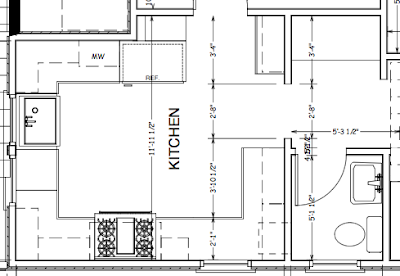 This kitchen plan expands the kitchen into the adjacent breakfast nook/finished porch. 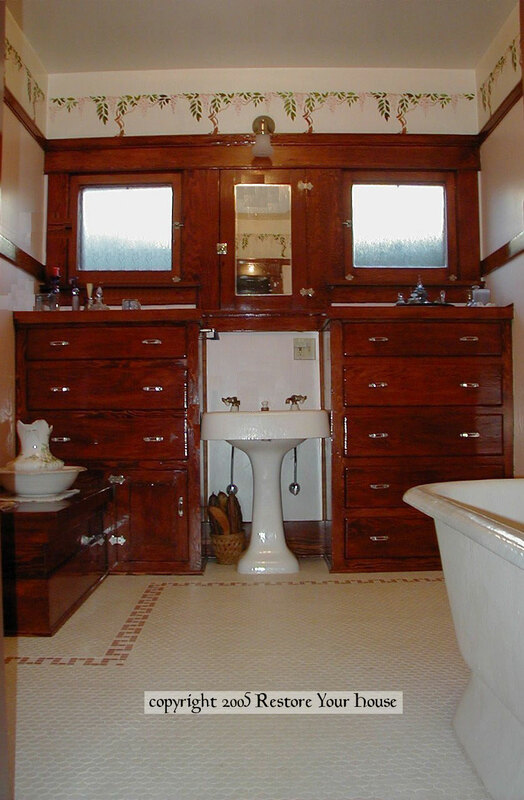 It also moves the wall to give the half-bath on the main floor a bit more space. Right now that bathroom is barely wider than the 24" door. 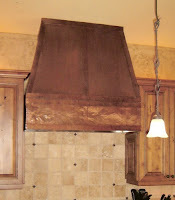 I am still pondering finishes like the sink and range hood. I'm tempted to go with copper. I found these two items that are calling to me. The sink is sold by The Copper Depot; the range hood by The Metal Peddlar. Though, I'm concerned if I go with copper, I'm going to want to use it everywhere else too, i.e. knobs, hinges, etc. I have a matchy matchy problem. I'm currently trying to persuade myself that it's OK to use brass or stainless everywhere else. 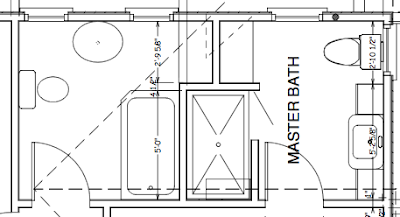 We're also going to add a bathroom in a finished sleeping porch adjoining the master bedroom that we're currently using to store unpacked clothing boxes. 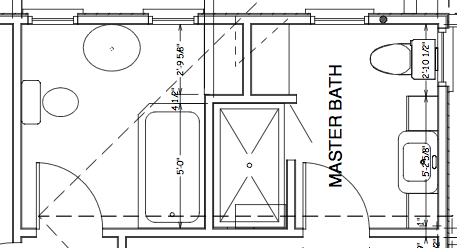 This is the current plan for the new master bath, pictured with the adjacent (existing) bathroom because we're going to punch through its wall to add a linen closet. 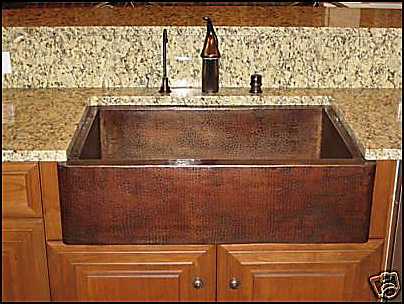 The sink area is going to look something like this bathroom. 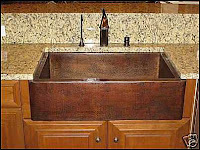 The cabinets on either side of the sink will be shorter, though; probably not much taller than the sink itself. I really wanted the toilet on the other wall, facing the window, but it is not to be. The fireplace chimney is in the way of where we would need to run up the plumbing. This arrangement will have to do. In addition to these two rooms, we're also making a few changes in the basement, like punching a door out to the backyard. And, upstairs, we're going to finish the second sleeping porch into a laundry room/storage area. And, of course, one of the main goals: All of the main floor woodwork will get its white paint stripped off! I can hardly wait. They're going to strip the paint as part of the remodel? Awesome! The plans look great. Can't wait to see the finished product! 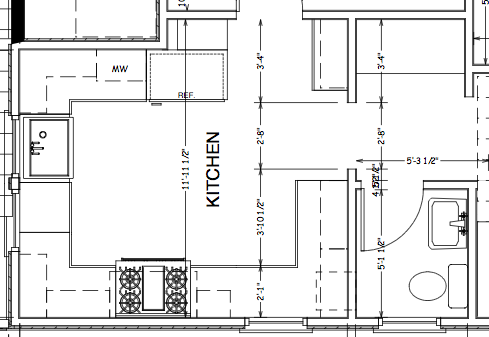 Thanks for this house floor plan. The idea your presented is really helpful for us who were in the process of house planning.